It is time to talk about My Starbucks Idea again! Starbucks has revamped and improved the site as of yesterday late night, and this time with all true improvements after a night of site maintenance. Time to invite my readers to come check out the improvements. So what has changed? The big change is that there are now profiles!! For the first time, users can have a profile. It’s a very mini profile, but it is something. A user can provide a name, location, and favorite beverage. The box that allows you to write in your favorite drink has some limitations. Apparently you are not allowed to use it for links or urls to your favorite website, as you might do with a profile signature, or other free form profile box. Either that, or Starbucks doesn’t like StarbucksMelody.com. I’ve tried several times today to put StarbucksMelody.com in the box, in a couple of different ways, and lo and behold, moderators remove the link. I guess you’re really only allowed to put a favorite drink in that box. The profile shows when you hang your cursor over a participant’s name within a comment thread. There a number of smaller, but also important changes. The site layout seems easier to read in terms of colors. It takes fewer clicks to get to comments now, because you don’t have to constantly click and unclick the hide/view comments button. The comments area now has a basic text editor! Participants can place comments in bold, or italics, and paragraph breaks finally work again. The site seems to load faster too. Some participants have icons near their names indicating “top commenter”. I’m not sure I even want to be known as a “top commenter” but I guess I am flattered! Every change that was made looks like a much needed improvement. You can now see which way you voted on a thread too. That’s a little thing, but a welcome change also. Previously, you voted on a thread, and the thumb-voting icons showed that you voted, but there was no way to go back later and refresh your memory how you voted. On a loosely related topic, the photo for this thread shows off my prized latest Starbucks schwag. 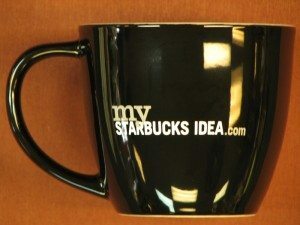 A kind person at the Starbucks Support Center completely surprised me by sending me this authentic mystarbucksidea.com coffee mug! Someone knows my pretty big soft spot for all things MSI. I love it! Thank you! Casi Cielo coffee returns to Starbucks on January 12th! Starbucks launches Costa Rica Hacienda Alsacia coffee, merchandise & visitor’s center. Starbucks Upstanders season 2: Ordinary People do Great Things. Seattle Seahawks Player Luke Willson Works as a Starbucks Barista! I’m sitting here this morning enjoying some Africa Kitamu…I wish Starbucks stores would include that in there lineup. Is anyone aware of any sites or groups (not eBay!!) where people have Starbucks cards they are willing to trade or sell? There are a few older designs that I don’t really think are super rare that I would like to have. Ooops I meant their…guess I need more coffee! I do enjoy the changes to MSI! I think although there are plenty of additional improvements that could have been made i am pleased with what has been done and can hope this is the start of a more frequent improvement schedule. Hi there…I can’t get the new web site. Every time I sign in I get nothing and after waiting a long time more I still get nothing. I am anxious to bold face my comments like before so they stand out in the crowd. I never did like to click “view comments” to view the comments since that is why you are there in the first place to view the comments so I thought that was a waste and am glad to note that it’s gone only wish I could see it. I thought Melody a while ago when we were discussing changes suggested they use a light colored background instead of white and the moderators thought it was a good idea. Also I thought someone suggested getting rid of the leaderboard which serves no worthwhile purpose other than bragging and substitute with something more meaningful like the up to date stock price for instance. I wonder if they made it so you can see your comments you made on previous threads like you used to be able to do. All this however is quite useless to me until I can actually see it. THANKS FOR LISTENING! Has SBUX ever thought of a “Foursquare” (foursquare.com) type idea that would alert you to when your friends are at a Starbucks? I could see something like this catching on. Or doing some sort of promo where the customer in the store who has the most stars at a certain, random time of day gets some prize or something. Hm. Never looked too much at MSI. Maybe I should check it out.. I only became aware of MSI when I began following you [I’m NEMapleQtee just to clear up confusion!] and so I don’t really have any opinions about the revamp and new profile section. However, despite not being able to comment on the upgrades and new features, I am totally in LOVE with this site. I guess I’m sort of a newbie when it comes to being a Starbucks addict, but I really adore this site and everything its members suggest. Sadly, we only have one Starbucks in the county I live in. Okay, well two, if you count the cafe in Barnes & Noble, but still. Maybe that’s why I’m a newbie? I lived in Edinburgh, Scotland for 5 years and I still crave some of the products they offered there that we can’t seem to find here. Blah. Ah well. and I agree..the profile change is great! (Reply to DG and LenkaLovee) – Hi! DG you just discovered MSI two weeks ago? It’s been through so many changes, and the latest version is by far the best! Did you find MSI through twitter? Through me? @LenkaLovee – I agree – These days so many people have a favorite site that they want to show off. I really think that the beverage box should be more of a “signature” box, or have both. It’s very limiting to have to only write your favorite beverage. I wonder if MSI thinks of my site as competition, but my traffic numbers are so low that that wouldn’t make sense. Melody — have your tried putting your web address in as your name? It may not provide a live link, but at least your address would be there in a form people could copy and paste. I was very wary of the MSI downtime for “enhancements”. Remember last time it created several days of login problems. Maybe Starbucks (or salesforce.com, their contractor) hired some new IT folks who know a thing or to about real web design and operation. The changes going in the right direction. I really enjoy your quality site. Makes a person want to practice their best netiquette. (Reply to DadCooks) – Hey first off I love your avatar! So cute! I really need to get one. Secondly, when I was writing this blog post, for the sake of experimentation I was playing around with my MSI profile and put my first name as Starbucks and last name as Melody. The “Starbucks” doesn’t show up anywhere. I think that Starbucks has figured out someway to make it so that no user can use the name “Starbucks” as part of their name. As I think about it, the logical reason for such restriction might be that the MSI team don’t want there to be any confusion as to who is a moderator. 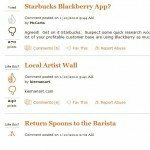 If users could throw “Starbucks” in their name, it is possible that they could come up with user names making them sound like mods. ??? Just a theory. Melody, good theory and probably correct. I also agree that the “beverage” box should also be a signature box. It seems that Starbucks may have reserved/restricted several names. One of my other web names is AmericanoMan. When I tried to sign up on MSI with it I got a message that the name was already in use. When I tried a couple of other name with Americano in them, same already in use message. Regarding my avatar; cats (and dogs too) have a special place in my and my family’s heart. We foster cats, two of our current four are special needs. I always forget about My Starbucks Idea until they send me an email, so I usually only visit the site a few times a year. Nice mug! Hi Sara! Welcome to my blog! I think a lot of people forget about MSI until they send out those emails. I’m glad you found my blog. Hope you’ll come back – it’s a quiet community with a number of regulars. I just wish I could log into My Starbucks Rewards using my Starbucks account name….but it wont take all 31 characters of my email address. Same flaw with logging in for WiFi…..
No one has answered my question why I can’t get on to the new MSI. All I get is bunch of clicks then it goes to that force.com whatever that is and then nothing folowed by more clicks followed by more nothing until I get fed up. I feel like an outsider and am so disappointed that I’m going back to bed. I would also like to put my picture on like so many people have done since I do not like my generic picture it doesn’t reflect me and is so blah. (Reply to Steve) – Well that is very mysterious Steve. If you can log in to manage your cards, then you at least know that you’ve got the right user name and pass word. ^ I thought I’d seen that you had made some comments in the Ideas in Action area of the site. It seems very odd that you would be able to access that, but not the Ideas part of the site. It’s possible that the site was down when you tried to log in before. Third, if it still doesn’t work, if I were you I would send an email to info@mystarbucksidea.com and ask them for help. As for the avatar – I assume that you want a picture like DadCooks has or something like that. That is called an “avatar”. I don’t use one, though I probably should. I’ve mentioned to you before, but you need to go to gravatar.com and set up a picture there. The link is on the side blog roll of this website. I can’t help you anymore than simply referring you to gravatar.com because I don’t know anymore than that. At MSI, there is no way to have an avatar. (reply to Steve) — your problem could be browser related. For a long time all Starbucks sites only worked reliably with Internet Explorer. Now Starbucks sites work well/reliably (for the most part) with only the latest versions of Internet Explorer (IE 8.0) and Firefox (3.5). I have done only sporadic and minimal testing with Safari, Opera, and Chrome so I cannot really say that they will always work. Your problem could also be cookie related; either not accepting third-party cookies and/or there is an old bad cookie. Check to see that your browser is set to accept third-party cookies and clear all of your old cookies. Thanks Melody I think I’ll try your suggestions after breakfast. It is weird and a conundrum to be sure. Of course cyber space always be a bodacious conundrum to me. The way I got into the Ideas section is I clicked on the link you had on one of your tweets. Yes I would like to have my picture on just like that Pinkie girl and others so I’ll try to figure it out on that gravatar.com. I did e-mail Cecile. Thanks for your help Melody. Well I did it, or at least I think I did so here goes. Hold your breath! Ha Ha Ha..I did it and it was so easy even a cave man could do it!! (Reply to Steve) Congrats on getting the avatar! Did you look at DadCooks advice about cookies and browsers? Thanks for the congratulations Melody. All I did was go to that web site you told me about and followed the directions. I would have preferred to have that white line on the right side not in there like my twitter picture but I guess you can’t have your druthers all the time and I’m just salubriously happy that I have my pretty smiling face for everyone to look at instead of that generic thing. As for MSI it worked before they started to tinker with it and as for cookies I prefer chocolate chip! I like your blog because it is about real passion for Starbucks. I think it is excellent that you are providing a forum for those with a passion for the Siren. PPR, Bringing back bold, the Gold Card, etc. are just a few of the examples of the passion that has poured into MSI from customers but continue to be ignored or “spun” another way by the SSC. On 10/6, Sarah from Corporate chimed in after only three other customer comments to claim the good news that Loose leaf tea would be hitting the store shelves soon. The entire thread earned only 740 points and received 7 comments. My personal opinion on the loose leaf teas is that their introduction is a way to boost the price of brewed teas (and perhaps to offer a better quality product). I believe that this has been in the works and had nothing to do with customer demand, but instead was a way to grow revenue and respond to the growth of Argo Tea, Teavana, etc. To me, this is clearly an example of Starbucks deciding to do something and then retrofitting it to an idea or comment posted on MSI. Hi CD! If you’ve been following the conversation about MSI mods removing “starbucksmelody.com” from the drink box, it is gone again… Clearly they have a beef with this site. So many websites include a signature aspect as part of a profile and there is a difference between having a non-obtrusive signature and spamming a site! You have an interesting theory about the management at Starbucks coming up with ideas and then retrofitting them to MSI. Though, that wouldn’t explain something like the short-lived GOOD sheets! Does anyone else notice that there seems to be a constant “Let’s see what the community thinks…” to threads that are NOT started by regulars to the site. It seems like it is part of some mod protocol/MSI mod handbook. I have more to say but I have got to get going to work! 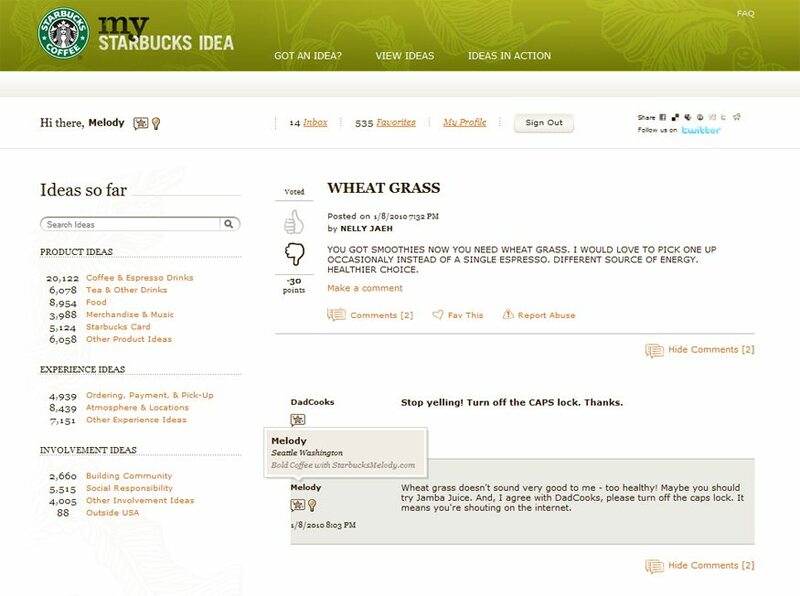 I have been following the conversation about the removal of starbucksmelody.com. I think it is another interesting example of Starbucks being inconsistent in applying their policies and perhaps applying those policies only when they best serve Starbucks. I was honestly surprised that they allowed your personalized card to have your starbucksmelody.com URL printed on the card. I remember they initially rejected anything that used the name Starbucks. Having allowed your URL on your card and not allowing it on MSI seems very inconsistent to me. I agree with both CD’s comments. Starbucks came out with the gold card that rewarded customers with a 10% discount on every puschase thereby encourging people to buy more stuff than they normally would. Savings on the first $250. would pay for the card making it essentally free and then then everything else would be savings. It was a good deal both for the customer and for Starbucks and there were many favorable comments on the gold card. Did Starbucks listen to us? Not really and what do we have now? After only one year they replaced it with a glorfied punch card that rewards customers with a “free” drink that they actually pay for in the hidden markup after 15 (not 10 like most punch cards) purchases that not only must be purchased separately (if you buy a drink for you and one for a friend you must get them rung up separately) but you must pay for it with money you load on your card thereby giving Starbucks free use of your money. This assumes you are at the gold level. If you are just starting out you must collect 45 stars for your first “free” drink. 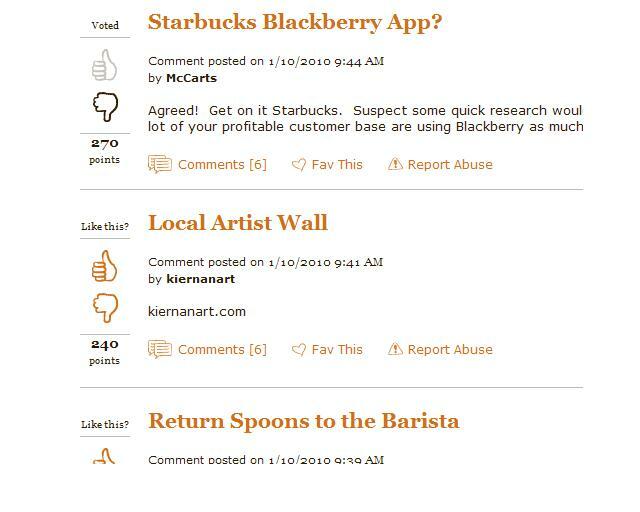 On CD’s second comment I can see why Starbucks would object to someone’s web site IF it was a commercial web site. 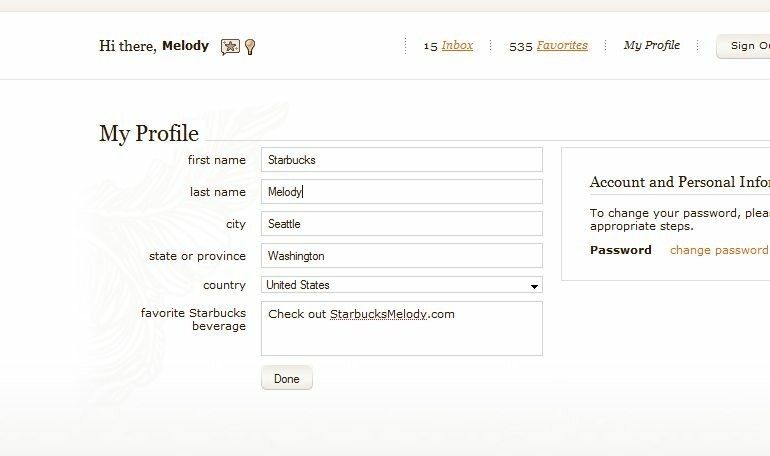 But Melody’s web site is most certainly not for commercial purposes and in fact promotes Starbucks so I see no reason why StarbucksMelody.com can’t be on and I just think they are being sort of nit picky. At least those are my views. Love the mug in the blog post and also the lunch box you linked to. Gee I feel left out. Everyone is commenting how great the new MSI is and I can’t even get it. I sent Cecile an e-mail but I don’t think she’ll answer. But do I feel bad? Yes I do but life goes on with or without MSI. @Steve you still can’t log in to MSI? I know this is weird, but is there any chance you’ve been banned? @CD – It would be a little less annoying if they communicated with me but instead they just modify my profile as they so choose. Why would I be banned Melody? I’ve been good. Sure I’ve been vocal on my disapproval of their “enhancements” of ther gold card but so has most everyone else. At any rate I’m not going to lose any sleep about it but I would like to once again bold face my comments like old times but life goes on with or without MSI. Neat! I’m a “top commenter” on MSI. WOOHOO! I signed onto MSI to comment on Melody’s issue and the thread is closed already. So few threads *ever* get closed it is strange that they shut this one down so quickly. Melody is quite the customer evangelist/advocate for Starbucks and I am puzzled by all of this. Common web etiquette/practices offer commenters the ability to enter a web site in their profile. to CD: (and everyone) amazing how quickly that thread was CLOSED today. record time. I agree with every point you made. There have been vulgar idiotic threads on msi for days and days and nothing is done, let alone closed! I’m just really aggravated about it, and Sbux lack of consistency. They were WRONG WRONG WRONG on this today….. I went to the link that CD gave and I am surprised, and a little shocked, why Cecile said what she did and then closed the thread in less than 3 hours. Why did they close it? Were they afraid more people would come to Melody’s defense? I am also shocked why they didn’t have the courtesy to at least let Melody know. It’s not like the don’t know how to get ahold of her. They have her e-mail. After all it’s not a commercial web site and it does promote Starbucks. It is obvious Melody spents a bodacious amount of time, effort, and her own money on her web site. If it was StarbucksSteve and they did the same thing to me I think I would take it down out of renenge. Hey Melody I signed up to be notified of followup comments to the posts I am interested in and it is a very cool and nifty feature and I like it. Hi Melody and All, While I could write a book on my opinions of MSI, I will say that while the aesthetics of the site are much improved the corporate rhetoric is enough to make my tummy do flip-flops, the scripted replies from the moderators are in no way genuine and I’m actually a little put off by them. I feel that those scripted replies do more harm than good. It also sounds by the tone of the moderators’ posts that they, themselves are tired of the site. Maybe Starbucks needs a new, fresh staff for MSI… And BTW ever since Matt G. left – the place has NEVER been the same. I think Cecile is very condensending and rude. Again just my opinions and thoughts. Good Coffee Day to You!